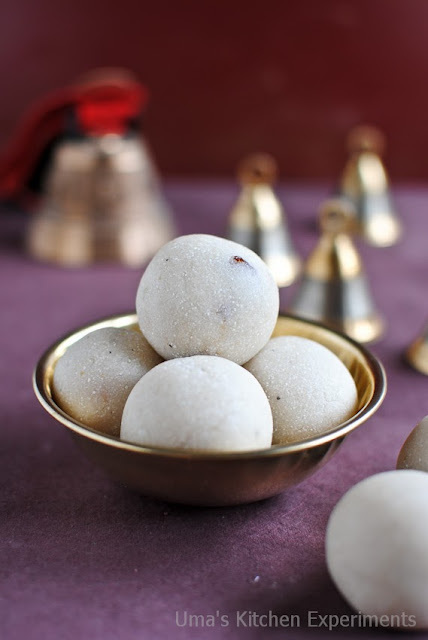 Those were days when I make only rava laddu at home and I find making this laddu is an easy job than any other laddu what we usually make at home. But for blogging purpose, I am making all other laddus and making it available to all others. 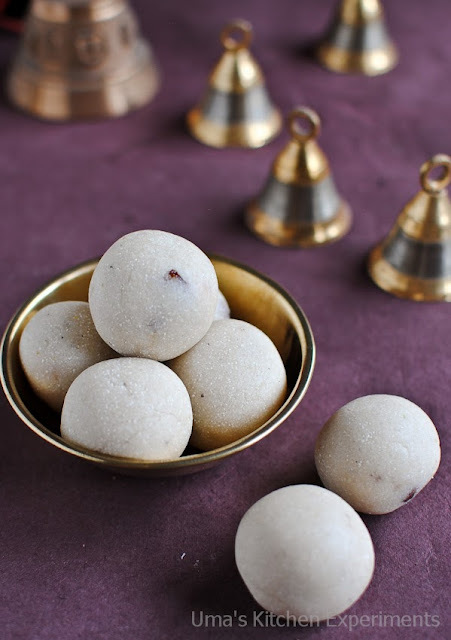 I came across sabudana laddu(Sago laddu) recipe when I was searching some other laddu recipe from my recipe collection. 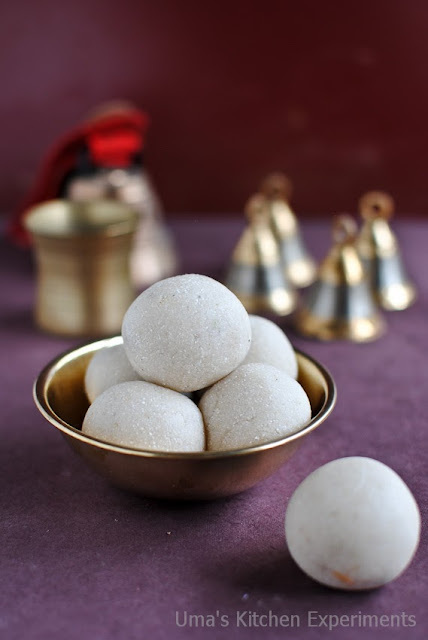 The preparation is similar to the making of rava laddu without coconut. The process was so simple and next time, I am planning to add grated coconut to add nice texture and taste. Green cardamom - 3 nos. 1) In a heavy bottom pan, dry roast the sabudana(javvarisi) until it changes to light brown colour. Transfer to a plate and cool down. 2) Make a powder of sugar and cardamom using a mixie. Transfer to a mixing bowl. 3) Now, make a smooth powder of roasted sabudana. 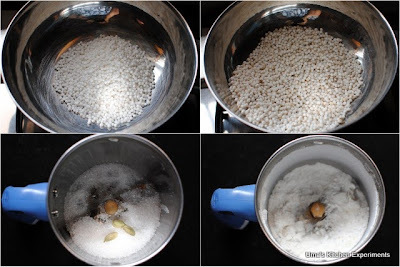 4) If you are not able to make smooth powder at single attempt, sift the sabudana powder. You get the sabudana granules. Make a powder of this again and repeat this step till you reach smooth consistency. Add the powdered sabudana to the mixing bowl in which we took powdered sugar. 5) In another pan, heat ghee and roast the cashews and raisins till the cashews turn golden brown and raisins become pulpy. 6) Add it to the mixing bowl along with ghee. Mix well. 7) Add ghee or milk slowly and make uniform shaped laddus. Try making laddus when the mixture is warm. Otherwise, it is difficult to make laddu. 8) Store it in a clean, closed container. Enjoy. 1) For longer shelf life and nice flavor use ghee. 2) Use milk only when you are going to consume laddus immediately else the laddus become slightly hard. Since I made it in small quantity and for calorie conscious, I used milk. Sprinkle milk just enough to make laddus. Else the sabudana becomes very sticky and you can not make laddus. 3) Instead of sugar, you can also add jaggery. 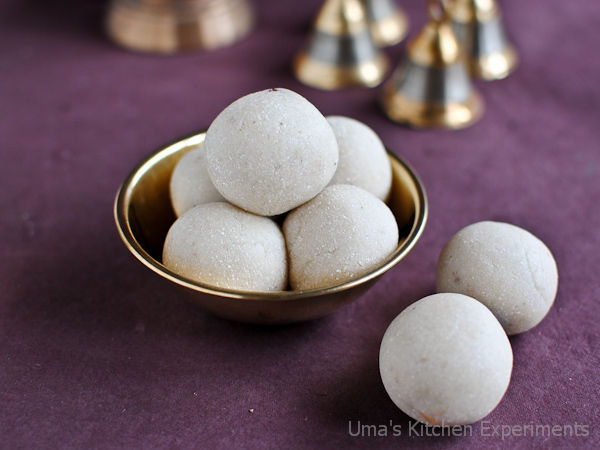 4) You can also add roasted grated coconut to this laddu to add nice texture and taste. But this reduces the shelf life of the laddu. I am definitely gonna try this.. looks so inviting. Ladoos look simply tempting and mouthwatering. Excellent preparation. sago laddu is new to me..will try it sometime, thanks for this quick laddu recipe! wow so perfect the shape is looks so good bell as prob is stunning uma very nice. sooperbb ones uma.. i love it..
A truly delicious ladoos and beautiful presentation. Very prefectly rolled laddoos..Love them very much..
Wow , looks so beautiful ! Perfect shaped laddoos looks super cute in that lovely bowl.